This is just a little heads up to our earlier story about enabling FaceTime on jailbroken iPhone 3GS. 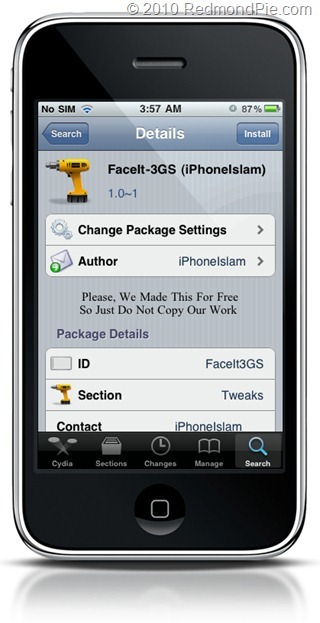 The folks over at iPhoneIslam have released FaceIt which can enable FaceTime calling option on iPhone 3GS. This tweak is available now on Cydia for free. All you have to do is to add http://apps.iphoneislam.com as repository in Cydia, and then search for “FaceIt-3GS” to install it. Once installed, reboot your iPhone 3GS and navigate to Settings –> Phone and turn on the toggle for FaceTime. There are however conflicting reports that FaceIt currently only enables voice (audio) calls on iPhone 3GS. We are not sure of it cause we haven’t tried it here yet. If you have installed the tweak, let us know how it went for you! You will, of course, need to have a jailbroken iPhone to install it. Follow our step by step guide posted here to jailbreak your iPhone, iPad or iPod touch with Limera1n or GreenPois0n if you haven’t already. UPDATE 1: Confirmed, FaceIt-3GS can do FaceTime video calls on iPhone 3GS.